Board games based on television or movie franchises are nothing new. Good tabletop games based on the screen, however, are a different matter. Far too many cater primarily to fans of the franchise; they’re decent games but not unique except for their franchise-based theme. Others may look beautiful but hide questionable gameplay, even bordering on asinine. That doesn’t mean there aren’t good games; Star Wars (at least recently) has been a prime example of translating fandom to the tabletop. I’m just wary when picking up anything that has a movie title on it, particularly when they’re costly. Luckily for me, my latest acquisition turned out to be worth every dollar: Big Trouble in Little China: the Game. Big Trouble in Little China is a game as epic as the movie on which it’s based, and that’s what you precisely end up playing. Players take on roles from the film as they encounter all the troubles (big or little) of Chinatown, while becoming embroiled with the henchmen of the ancient sorcerer, Lo Pan. Each game starts with your characters in the “Dragon of the Black Pool” Chinese restaurant, but where you go from there is up to you. As you move around the board, you’ll encounter henchman, monsters, or crates of useful items (and a few traps). More important, you’ll experience both Main and Side Quests, that help your character (and the story) develop. The trick is to defeat enemies and complete quests for both Chi (experience), Rewards (upgrades), and Audacity (group progression) before the game moves to the showdown with Lo Pan. There are two progression tracks initially: one for the Threat of “Big Trouble” and one for the Audacity of the players. The more enemies you defeat or quests you complete, the faster the player’s Audacity track fills; not only will you get bonus Chi along the way, but you’ll also have the advantage when entering Lo Pan’s lair. Take too long, however, or get beaten by the sorcerer’s henchman (or the Three Storms), and “Big Trouble” comes for the players sooner than later. Big Trouble is intimidating at first, with the huge number of components, rather thick rulebook, and large “footprint” it takes on a table. The game itself, however, runs rather smooth, whether you’re playing with four players or solo. In each round, a player rolls their Action Dice, allocates them to slots on their sheet to do things (Move, Attack, Tasks, etc. ), takes various free actions (start Quests, open Crates, etc. ), and then the turn moves to the next player. Once everyone is done, the enemies on the board move and attack, and then another round begins; “Big Trouble” is checked, Threat progresses, more enemies spawn, and the players rinse and repeat. Once either the Threat or Audacity token reaches their goal, the board is cleared and flipped over from Chinatown to Lo Pan’s Lair. Some components are put away, others are kept, and various Quests will determine how the players (and enemies) start for the showdown. If you didn’t complete quests or progress your characters, you’ll end up at a severe disadvantage and must fight your way to Lo Pan. If you did well, you might be able to rush right in (maybe through some henchmen or a couple of “minibosses”) and begin the final fight. I usually like to go into detail about the various rules, but Big Trouble is a bit too complex for the space in this article. So, instead, I’d like to talk about the gaming styles you’ll encounter, as this game is a mix of different types. For one, Big Trouble sets up like Arkham Horror or Star Wars: Rebellion, with many decks, dice, tokens, sheets, etc. Some setup is random (e.g., Quests) and changes depending on the number of players (e.g., Minions); this allows not only a scalable challenge, but also makes each session unique. Similar to Zombicide or Imperial Assault, you have a character sheet that “levels up” through the course of the game. One difference is the “stats” are replaced with dice slots, which provides each character an advantage using specific dice (Body, Mind, or Spirit). Minions and bosses also have their own cards (or sheets), like Maximum Apocalypse or Ghostbusters, which offer a target stat (to kill or damage them), rewards for defeating them, consequences for missed rolls, and their movement and attacks. Rules dictate how they move, who they target, etc., so this is an entirely coop adventure (with no GM or enemy player necessary). Big Trouble also borrows a technique from games like Betrayal at House on the Hill; specifically a Quest Book that you read aloud when a Main Quest is activated. Similar to “Choose Your Own Adventure” books, these quests can take multiple turns, require different types of actions (from various players), and lead through good and bad consequences. Like several of the games I’ve mentioned, all characters and enemies also have figurines to represent them on the board. When it comes to visuals, in fact, Big Trouble is one of the coolest looking games we’ve played, and I definitely want to paint my miniatures. Despite its complexity, Big Trouble succeeds where other franchise games have failed. Although it follows the same “railroad” plot of the movie, each game is different thanks to the random setup, scalable play, numerous characters, and in-game choices. Visually, it’s incredible, from the board’s representation of Chinatown and Lo Pan’s Lair, to the gaudy 80’s imagery, to the figurines. Much of this is thanks to the art from Boom! Studios, which also makes the Big Trouble in Little China comic book. The box is enormous, and that’s because they provide a second level with an insert that holds all the miniatures for the game. I loved this, but was a bit disappointed they offered no baggies for the numerous tokens; luckily, I have a lot leftover from my other games. Also, everyone should be warned about the play time and the table space necessary to get through an entire session. Like Arkham Horror or Twilight Imperium, this is a game you need to plan to play; although I finished a solo session in a little over an hour, our multiplayer games often ran 2-3 hours. One final warning: they’ve had a problem with some faulty components. 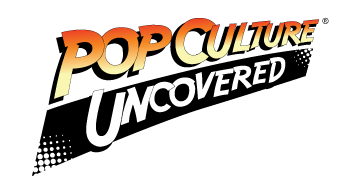 Our retail copy contained improperly printed dice, a known flaw, but Everything Epic is well aware and has set up a FAQ and contact so that they can send you the correct items. Despite some bad franchise-based board games in the past, Big Trouble has proven its worth. Our group enjoyed the game, even more than some of the staples we’ve mentioned. 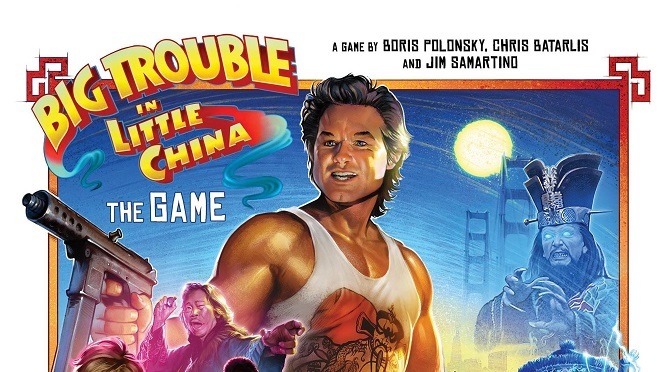 Big Trouble in Little China: the Game is on shelves now. 1-4 players, 120 minutes, Ages 14+. I give Big Trouble an audacious 5 fortune cookies out of 5.